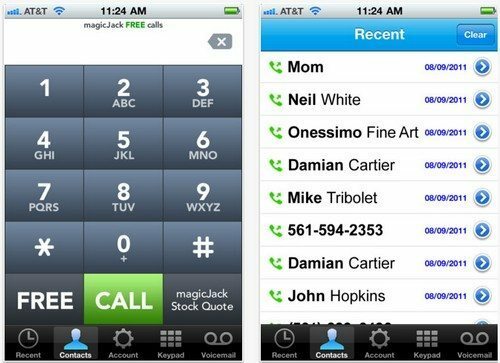 We thought we’d take a little step back in time today to remind the iOS user of a mobile app that has been out for quite some time on the iOS platform, and that app is called magicJack, an iOS app that enables users to make free calls to United States and Canadian numbers or any magicJack number anywhere in the world. So just in case you aren’t already using the magicJack iOS app, here a little reminder of what the application offers the user, the mobile magicJack app for the iPhone will never use your minutes, it does not require a voice plan, and is 100 percent free. The magicJack app for iOS enables the user to make outgoing call to USA and Canadian landlines and mobile phone numbers, and any magicJack number, and using a magicJack phone number enables the user to make and receive free calls and get free voicemail. When you sign up for a magicJack account you are given a magicJack number, with all magicJack numbers starting and ending in an asterisk/star, for example *12345677* which can be dialled from any magicJack, and of course you can used your iPhone stored contacts with the magicJack app. So there you have it a quick reminder of what the magicJack app for iOS is all about, and if you aren’t already using the magicJack app you can garb the application for free by hitting up iTunes. We’d love to know if any of our readers are still using the magicJack app on their iPhone, or if not is the app something you would consider using? Feel free to let us know by dropping a line to our comments area below. Thanks for the info. Did not know you could use magicJack for cell phone. I have Magic Jack for 3 years and love it. I just downloaded this app to my android phone. Combined with my unlimited data (5 gigs at 4G) plan, this gives me unlimited voice, data and text for $30 a month. Plus it instantly turned my cell phone into a two line phone and I can take calls on my home phone even when I am not home. This is great. Who is your cell provider? It looks like this may be exactly what I’m looking for! Can I keep my existing cell phone number? If this runs on wifi in my home what happens to incoming calls when I leave home? It doesn’t impact your cell number at all. It doesn’t use your voice coverage, only data. As far as leaving your house, I don’t know how it works when you actually sign up for a Magic Jack account, but if you use the completely free method, it’s only good for outgoing. By no means will this replace your voice plan, but it’ll save you in North American long distance and provide you with a method of calling back home (to NA) when you have data available to you – via wifi – while travelling abroad. I use Magic Jack on my Android phone Samsung Galaxy S Advance. I use it with my Home and office WiFi network. The audio quality is so excellent that there is no comparison with any other product on this earth. I have tried so many other apps like viber, vonage, net talk, skype. and none of these products come anywhere close to Magic Jack. Plenty of audio breaks in all the names mentioned above. Magic Jack is just amazing to call any landline or mobile in US & Canada for free. Once you start using it you will realize what I am saying. How do they call mj number (*12345677*) not using magic jack number? I used this app on my i5 while I was in China in November and in Guyana in December. It performed excellent for me for the most part. I think there was one conversation where I was at the Trinidad airport and didn’t have the best wifi connection. The party on the other end could hear my clearly, but I struggled to hear them. Aside from that, I’ve had no issues calling both to Canada and the US. I’m new to the Apple world, so I don’t have a world of apps. But this is one of the first apps (because it’s useful and practical) that I recommend to people.